Food allergies are common, but so too are adverse reactions to insect stings. But while allergic reactions to bee stings can be damaging or even deadly, new evidence shows that it’s our body’s way of trying to protect us — a reaction that for some people goes way too far. Bee stings are a serious problem for over 2 million Americans. 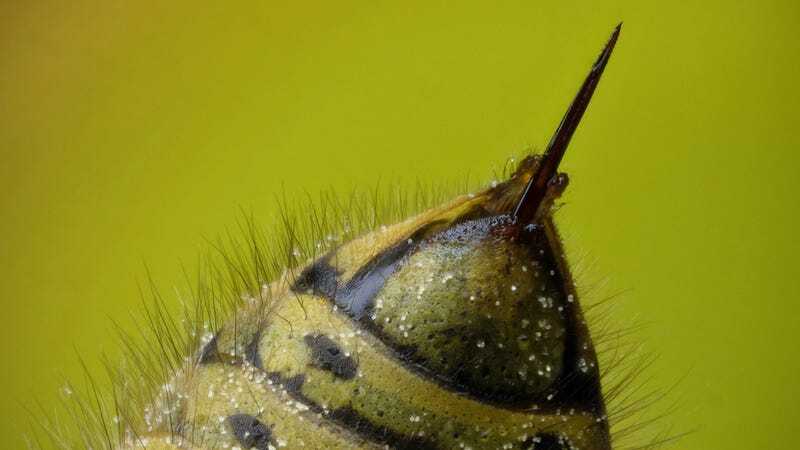 Approximately 50 deaths each year in the U.S. are attributed to insect sting allergies. Unlike a normal reaction to a bee sting, like pain, swelling, and redness around the sting bite, a bee venom allergy will trigger an anaphylactic reaction. Symptoms include difficulty breathing, swelling of the face, throat or mouth, wheezing, difficulty swallowing, and an increased pulse. Sometimes an anaphylactic reaction is so severe that it can lead to shock, cardiac arrest, and unconsciousness in 10 minutes or less. This type of reaction can be fatal, and it’s imperative that a person experiencing these symptoms get immediate medical attention. Bees, like some arachnids and reptiles, have evolved the ability to protect themselves by injecting venom into their targets — a complex mixture of toxic components that kickstarts an immune response in the victim. Bee venom consists of various enzymes, peptides, proteases, and bioactive substances. The enzyme PLA2 (phospholipase A2) is particularly nasty as it wreaks havoc by destroying cellular membranes. No, that spider didn&apos;t bite you. Probably. Taken together, it's a concoction that’s considered a major class of noxious allergens. Scientists have learned that insect venom, and bee stings in particular, can induce a type 2 immune response in both humans and mice — an over-the-top hyperimmune reaction that’s highly problematic for the victim. And indeed, this has been the thinking for years — that our bodies react to bee stings by inducing a misdirected immune response (the so-called "toxin hypothesis of allergy"). But as the results of two new studies show, it may not be misdirected at all. Rather, our immune response to insect venom may have evolved as a form of protection. It’s just that for some people, this allergic reaction gets out of control, causing serious problems. In the first study, which was performed by Martin Metz of Charité-Universitätsmedizin Berlin and Stephen Galli of Stanford University School of Medicine, mice injected with two-stings worth of honeybee venom developed a specific immune response — a response that subsequently increased their resistance to potentially lethal amounts of venom. The team replicated the effect after subjecting the mice to poisonous snake venom. According to the researchers, the protective effect was conferred by the IgE antibodies — protective agents that respond to a wide array of environmental antigens, many of them quite harmless. So rather than seeing IgE responses as something bad, it's actually good. For the second study, Ruslan Medzhitov of Yale University School of Medicine showed how the PLA2 enzyme induced the type 2 immune response in mice — and how it gave them later protection against near-lethal doses of the damaging enzyme. Specifically, mice with five-stings worth of venom were three times more likely to survive than mice injected with a salt solution. Actually, the researchers aren’t entirely sure why in some cases this supposedly beneficial response elicits an anaphylactic reaction. Normally, a normal or mild allergic reaction, in an effort to protect us, makes us sneeze, cough, vomit, and itch. Sure, these aren’t pleasant things — but they’re responses designed by evolution to help us expel something harmful from the body. But it’s certainly not something that's supposed to kill us. According to the researchers, one possibility is that it’s genetic. Some people may have a biological predisposition towards especially severe IgE-dependent reactions that cause anaphylaxis — a theory supported by clinical observations. Which is interesting if true, because it would mean that people could eventually be genetically tested to see if they’re allergic to bee stings. You can read both studies in the journal Cell and Immunity, here and here.